Comments: Obi-Wan Kenobi and Master Yoda find themselves in the midst of tragic circumstances and must decide the fates of the newborn Skywalker twins. Senator Bail Organa volunteers to adopt Leia, while Yoda instructs Obi-Wan to deliver Luke to his aunt and uncle on Tatooine. After giving Luke to his family, Obi-Wan goes into seclusion on Tatooine. He will one day guide young Luke in the ways of the Force. The separation of the twins is a difficult decision, but Obi-Wan and Yoda are confident that there will be a day when it will prove key in the return of the Jedi. 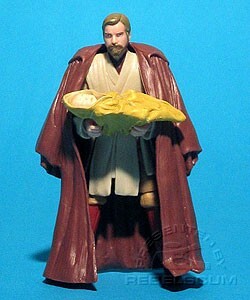 Obi-Wan Kenobi is the same figure as Obi-Wan Kenobi III-55, but this time he comes with infant Luke Skywaker.